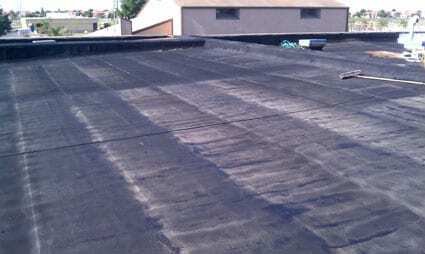 he 18 year old BUR roof system with ongoing leaks for several years is restored to watertight condition in a matter of days with a new TRITOflex waterproofing membrane system. The Navy did not want to tear-off the built-up roof and open the building up to the elements. Additionally, there were sections of this building that were added on to at some point and the deteriorating expansion joints between the sections were an issue that required attention. To avoid a tear-off, the architect recommended a recovery of the existing roof system with 80 mils of liquid rubber waterproofing membrane system. TRITOflex is a water-based, environmentally safe coating system with no VOC’s. Also recommended was a 20 mil white acrylic top coat to be applied over the TRITOflex waterproofing membrane to create a reflective barrier to the sun and reduce heat absorption into the building. This recommendation addressed the building’s ongoing leaks and facilitated an aesthetically pleasing, monolithic waterproofing barrier over the existing deteriorated roof system and wall flashings. 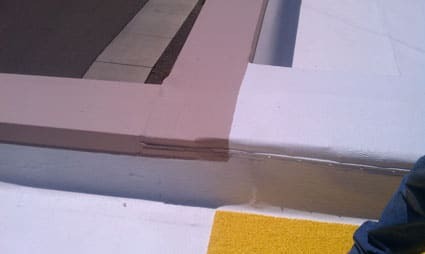 Due to the 1900% elongation properties of the TRITOflex membrane, the expansion joints were simply recovered with the liquid rubber coating also. The new roof recovery system was installed in 4 days without disturbing the occupants and will provide the Navy with a 20 year warrantied watertight roof that also reduces their cooling costs in hot California temperatures.